from the supplemental material of Sudmant et al..
As opposed to a large part of the Y chromosome and mtDNA which are uniparentally inherited and which are discussed on my main genealogy page, the autosomal DNA is inherited from both parents and undergoes recombination. 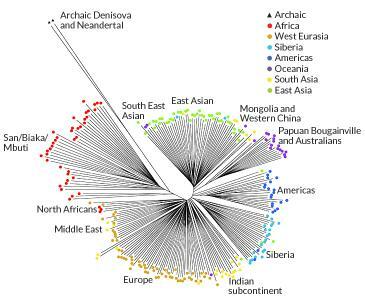 As a result, tracing deep genealogy through it needs a rather different kind of analysis in which we try to determine it as an admixture of different ancestral pools of DNA. The resulting analysis will, of course, depend on which these pools are chosen to be, and that shows up in the analyses presented here. Overall, I am a rather typical representative of an East Indian population: closer to Europeans than to East Asians or Africans; but not as ‘pure’ South Asian as South Indians: with tinges of Central or West Asian and North European in the mix. A common point of confusion concerns the similarity numbers: the typical similarity between humans from different parts of the world is 99.5% or more. Most of the differences are, however, small or large repeats which are usually not sequenced, and even identical twins are often slightly different if we count these differences. On the other hand, if we only count base change, the typical similarity exceeds 99.9%; that, however, still leaves about 3–4 million differences scatterred all over the genome. These changes are slow, and hence most of these are inherited over tens of thousands of years: so we can find the likely places of differences between people. The tests that form the basis of most of the analysis, focuses on about a million of these locations where variation is expected, so that within these, typically unrelated individuals may have as little as 67% similarity. The similarity of people within a racial group, especially outside Africa, is, however, much higher: often rising to above 73% within even large groups of people. Your browser does not support frames. Go here to see the animation. or a dendogram (click it for full size). The dendograms makes clear that the affinity is to the Brahmins. 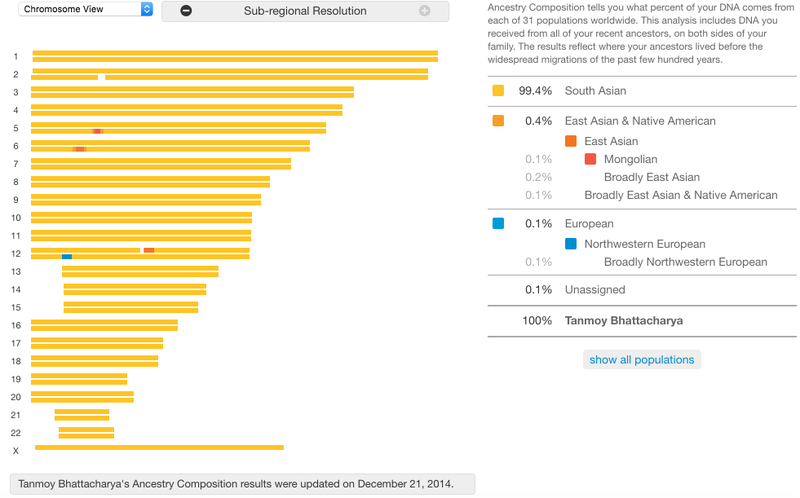 autosomal data (I am ‘Bengali Brahmin’ near (0,-3)) from the Indian subcontinent. with the populations given symbolic names. The Harappa Ancestry Project by Zach specializes in South Asian samples and performed a 4-way and 12-way admixture 1.04 analysis on its participants including me. In the former analysis, I had 60% S Asian, 33% European, 7% E Asian, and no African component, whereas in the latter analysis, I had 61% S. Asian, 20% Baloch/Caucasian, 10% European, 4% Kalash, 3% SE Asian, 3% Siberian, and no SW Asian, Papuan, NE Asian, E Bantu, W African, or E African. (These group names are just labels: see the maps created by Simranjit, and the ones he created for the Brahmin participants, for an idea of what they are.) At the intermediate K=9 level, I am 62% S Asian, 19% Kalash, 11% European, 3% SE Asian, 2% SW Asian, 2% NE Asian, and no Papuan, W. African or E. African. If only the South Asians, excluding the Kalash and Hazara are studied: a 3-way admixture with me being 33% S Indian, 30% Balochi and 37% gujrati is most aupported. A PCA analysis shows that the brahmins from different regions cluster togther, though the Punjabis fall into the Punjabi Brahmin cluster. 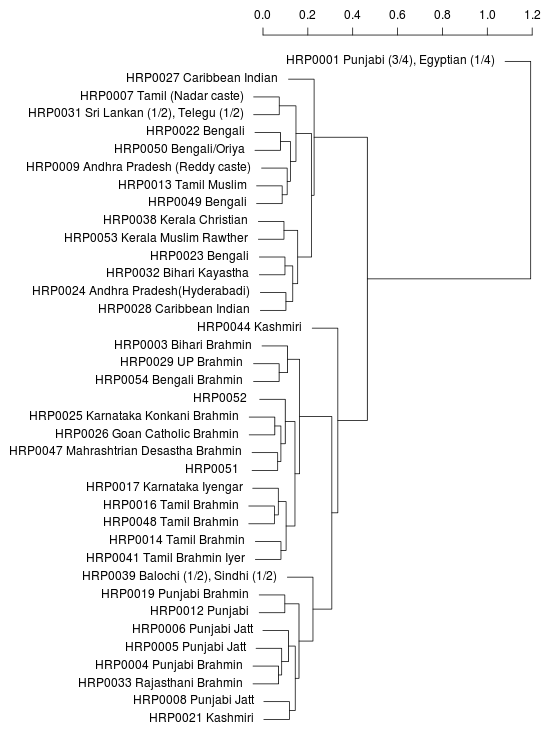 I (HRP0054) am most closely related to UP and Bihari Brahmins, which forms a cluster with Maharashtrian and South Indian brahmins. Using Mclust on this PCA data shows 14 significant clusters: I belong to 81% Cluster 3 and 19% Cluster 6; which among the reference populations (balochi, bnei-menashe-jews, brahui, cochin-jews, gujratis, makrani, malayan, north-kannadi, paniya, pathan, sakilli, sindhi, and singapore-indians) has one of the two Gujrati cluster and some Singapore Indians. 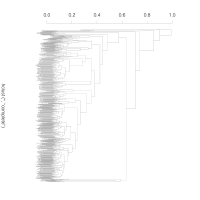 The 3d plot of the first three PCA components show these are not very close, however. The analysis of what he calls the Ref 2 set provides a more global view, but does not change these conclusions. The Ref 3, however, is more interesting: in this analysis, I am 54% S Asian, 23.6% Onge, 14% European, 4% South West Asian, 2% each of E Asian and Siberian, and no W African, E African, San/Pygmy, Papuan or American. 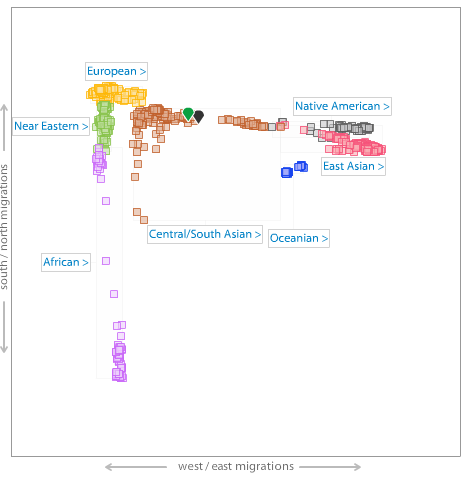 The interesting thing here is the separation of S Asian and Onge components (see here for the maps): the Onge component correlates linearly with the Ancestral South Asian component (see next section). In particular, ASI component is 1.3261 times the K=11 Onge component in this analysis plus 7.4125 with an r2 of 0.994. This can be used to calculate my ASI component asi 37.43%, slightly higher than that calculated in the next section. The admixture analysis still puts me in close proximity with the Bihari and UP brahmins, but somewhat further from, though still in a clade with, the S Indian brahmins. 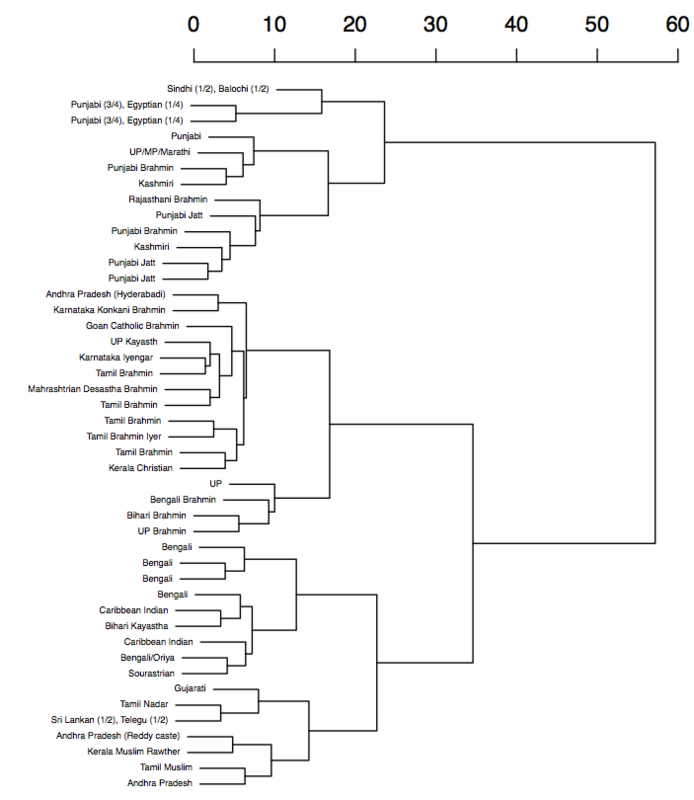 In this analysis, the Punjabis are outside the South/West/East Indian clade. In the Identity by State analysis and one using population concordance measure again show clear South Indian and Brahmin similarities. 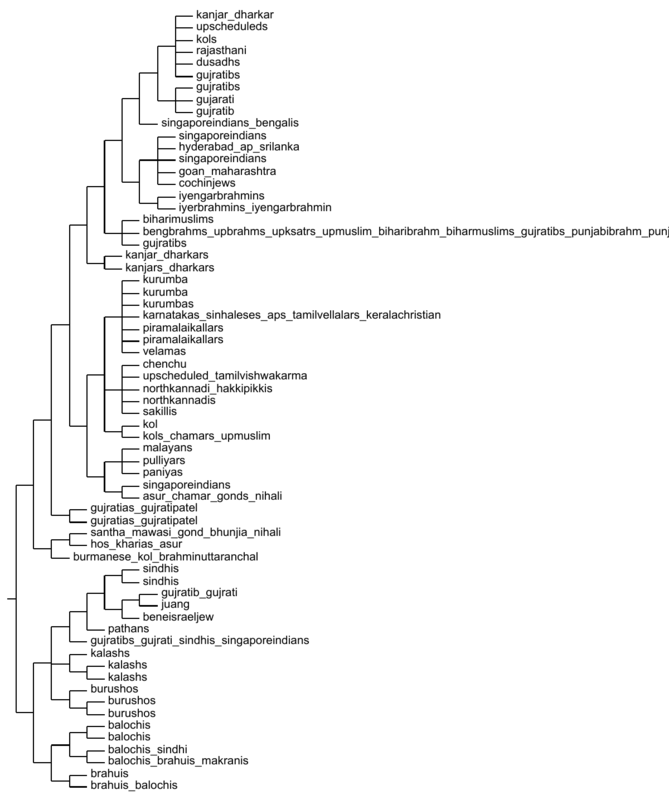 A finestructure analysis of the Eurasian populations clusters me into a group ‘pop185’, which is mainly North Indian Brahmins and Kshatriyas with some Gujratis and north Indian muslims. This group is a part of a tight cluster with Bihari muslims and more Gujratis. This entire group is part of the mainly north Indian cluster, which, however, also includes the Iyer/Iyengar brahmins, Cochin jews, Goans and Maharashtrians, and a few people from Andhra Pradesh and Srilanka. This north Indian group is sister to a clear South Indian cluster, with the Austrasiatic tribals forming an outgroup. The Sindhis, Kalash, Burushos, Balochis, Brahuis, Makranis, Pathans and Bene Israel Jews form a separate Indian cluster. The entire Indian group, however, is a sister to the other Asians. 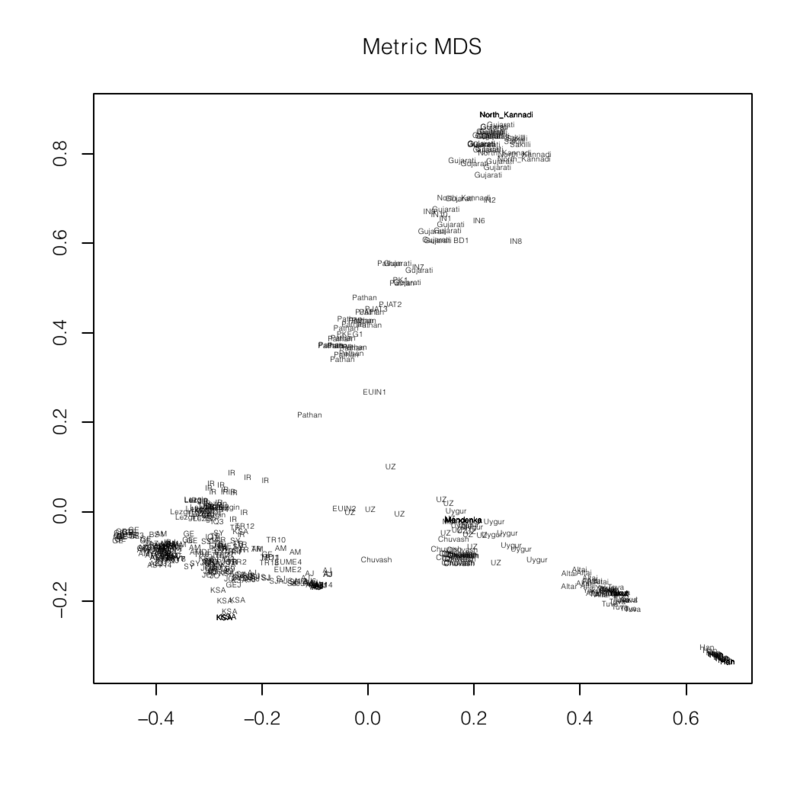 Me (near -40,20) on an MDS plot and as a dendogram created by Zack. In the latter, I am DOD430. DOD327 is Tamil Nadu Iyer and DOD331 is Karnataka Hebbar Iyengar. The North-West Indians (Punjabi, Sindhi, Balochi, etc.) are in the cluster with Zack (DOD128). 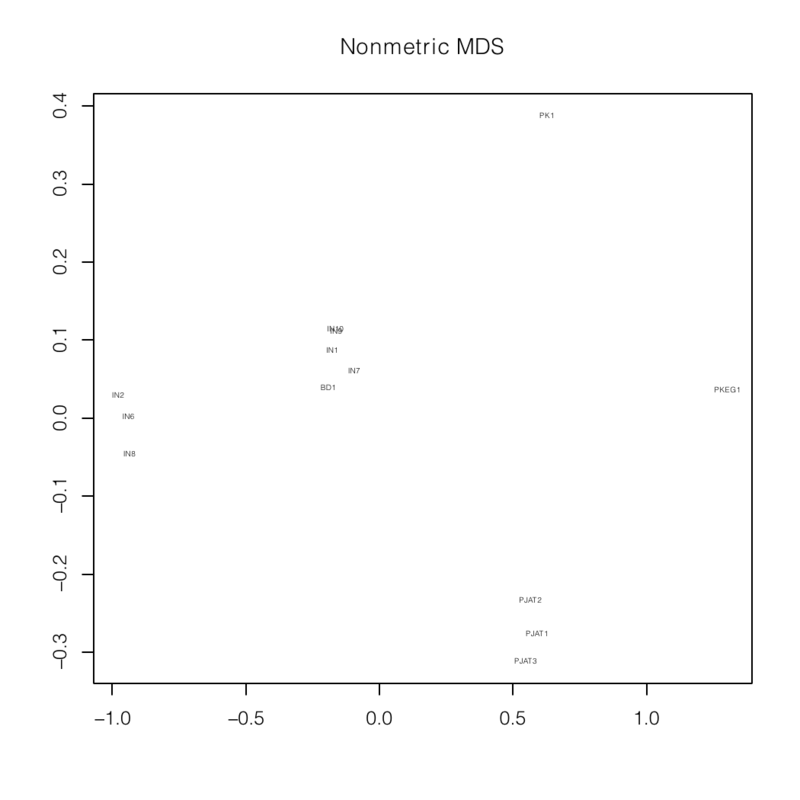 A mixture analysis of my autosomal data. whose mixtures create most of the Indian populations according to a recent study. from the ASI, AAA and ATB populations respectively. 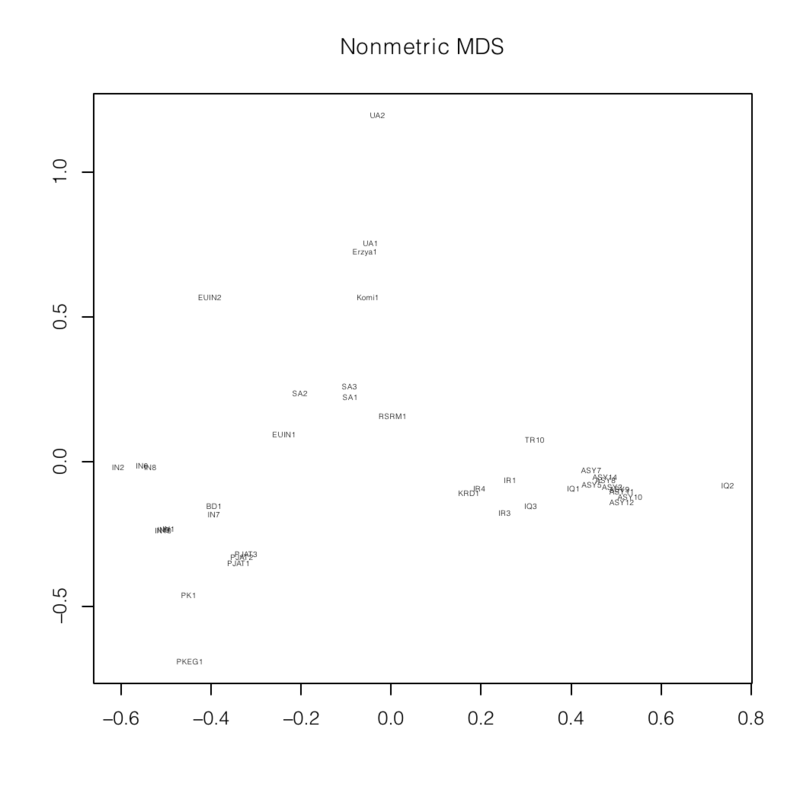 The Dodecad project also performs a multiway mixture analysis and parses me as 62.5% South Asian, 23.2% West Asian, 9.5% North European, 3.3% East Asian, 1.4 Northeast Asian, and none of South European, Southwest Asian, or Northwest, West, and East African. This project does not maintain a list of ethnicities, but project participants are free to reveal it. Using this, I performed a 2-d MDS analysis and this shows that I am a somewhat extreme member of their Indian cluster which otherwise has only South Indian, Punjabi Pathan and Comilla Muslims as identified members. The Indian cluster, not surprisingly sits apart from both the European/West Asian and the Filipino clusters. In an 11 dimensional cluster analysis, I belong as an outlier to cluster 17, which contains 8 project members (all I could trace were South Indians) and 6/25 of the Gujrati reference populations, but none of the 9 North Kannadi, 24 Sindhis, 22 Pathans, or 25 Burushos. On an admixture analysis of the Indian participants using K=4, I (DOD430) turn out to be 30.6% West Eurasian, 4% East Eurasian, 65.4% South Asian, and 0% African. Interestingly, this K=4 analysis maps on to the ancestral north Indian and ancestral south Indian populations identfied in a study of Indian populations in a particularly simple way: the ANI fraction is given as 0.779 times the West Eurasian fraction + 0.39674; with a r2 of 0.9823. As a result, I can be inferred to be about 63.5% ANI (Caucasoid), 32.5% ASI and about 4% East Eurasian (Mongoloid). 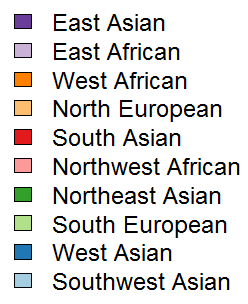 (Gujrati) in an autosomal MDS plot of Asian populations. specialized for South Asia and the Indian subcontinent. The Eurogenes project recently performed an analysis of their West+South+Central Asian samples using a seven way Structure analysis. In this description, I am 72% South Asian, 13% European, 10% Caucasus, 3% East Asian, 2% Siberian, and no Middle Eastern or Sub-Saharan components. I did a 2d mds analysis of this, and I am clearly in the North Indian cluster. In a separate supervised analysis of the South and West Asian samples in which the base populations were held fixed, my autosomal genetics could be explained as a mixture of about 44% South/West Indian (represented by North Kannadi, Sakilli and selected Gujrati) 40% Pakistani/NorthWest Indian (represented by Pathan and Sindhi), 9% Burusho, 3.5% North Slavic (represented by Polish and Belorussian), 2.5% Han Chinese, 0.08% Siberian (represented by Koryak, Nganassan and Yakut), 0.002% each of Balochi (including Brahui and Makrani) and West/Southern European (represented by French), and 0.001% of each of Anatolian-Caucasus (represented by Armenian and Georgian), Sub-saharan African (represented by Mandenka and Yoruba) and Middle Eastern (represented by Jordanian and Palestinian). 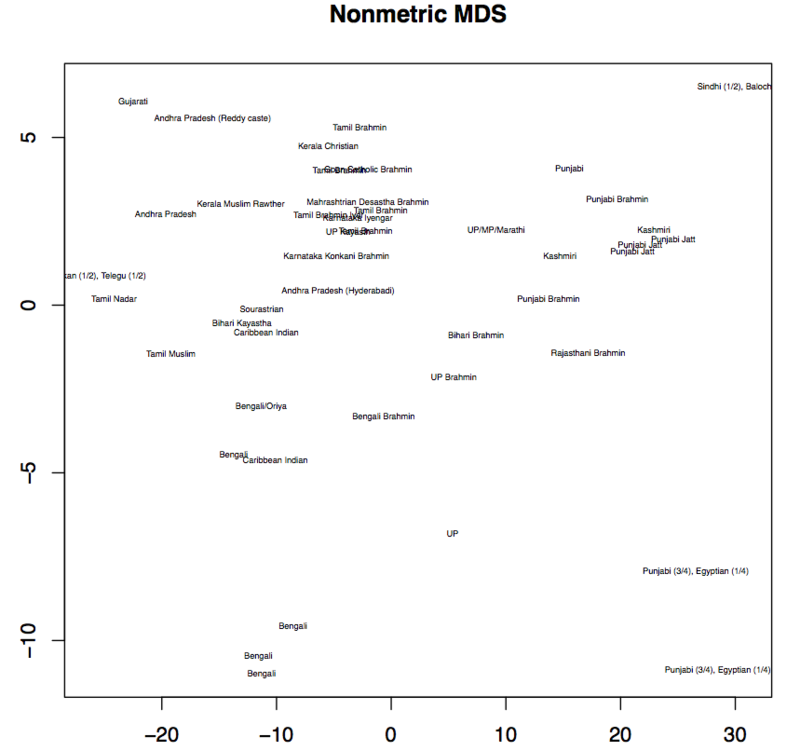 A nonmetric 2d MDS analysis clearly shows a region containing the samples from the Indian subcontinent; and a non-metric MDS analysis within the Indian cluster splits it into a mainly South Indian, an equimix Nort/South Indian (including me), a PJAT cluster with sizeable Balochi contribution, a Pakistani individual with sizeable Burusho, and another (PKEG) with sizeable middle eastern, contributions. In each of these latter cases, the North Indian component stays high, it is the South Indian component that predominantly gets replaced. In a K=8 analysis of populations from the ‘Neolithic belt’ I turn out to be 77.4% S Asian, 15.5% European+Anatolian, and 7% E Eurasian, with no N, WC, W, or E African, and no middle eastern. 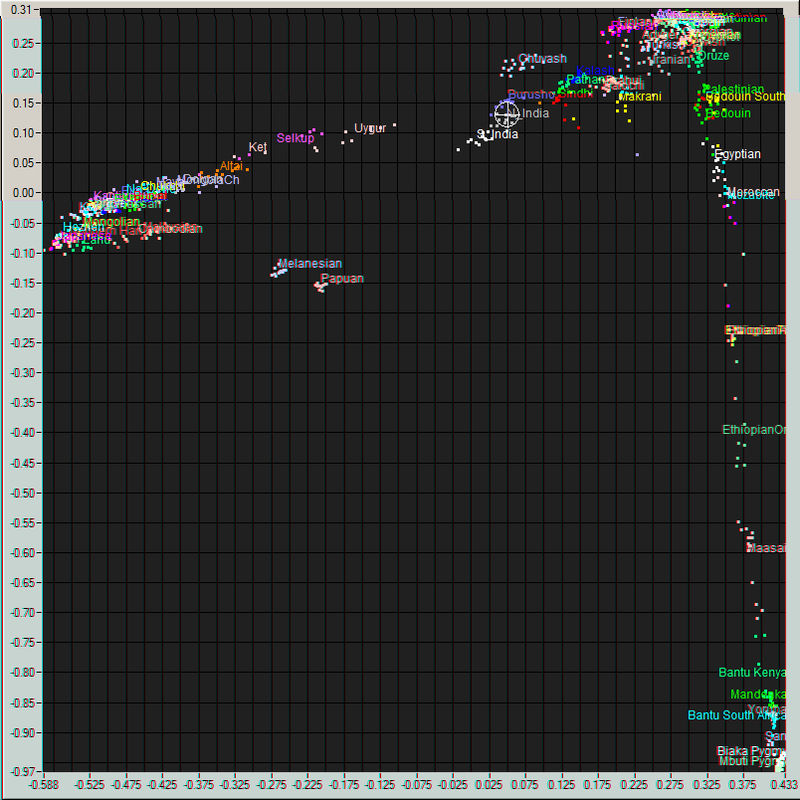 Me (green pointer) on an autosamal MDS plot of World and South Asian populations. the various autosomal chromosomes. Grey indicates lack of information. thanks to user Sudheer of 23andme, the lower West Bengal point is me. A new analysis shows I am basically South Asian with a small admixture of European and East Asian. 23andme would classify me as 86.1% South Asian, <0.1% East Asian & Native American, none of European, Middle Eastern & North African, Sub-Saharan African, or Oceanian, and 13.8% unassigned in a conservaive analysis (i.e., 90% confidence). In the standard analysis (75% confidence), the South Asian fraction goes up to 97.4%, the East Asian & Native American goes up to 0.2%, and the European to 0.1%, still leaving 2.3% unassigned. Finally, speculatively (i.e., at 51% confidence), 99.4% is South Asian, 0.4% is East Asian & Native American—of of which 0.1% is Mongolian and another 0.2% is broadly East Asian, the 0.1% European is broadly Northwestern European, and only 0.1% is unassigned. Earlier, 23andme chooses three ancestral populations, which then turn out to describe the African, European and East Asian populations raher purely. In this analysis, I am 82% European, 18% Asian and <1% African (all the African comes from a small region in Chromosome 6 which seems half African). Under an updated analysis with the top level categories being South Asian, European, East Asian & Native American, Middle Eastern & North African, Sub-Saharan African and Oceaninans, this became 96.1% South Asian, 0.1% European, and 0.1% East Asian (not Native American) in a conservative analysis. The standard analysis would call a further 2.1% to be South Asian, 0.3% as European and 0.1% as East Asian. A very aggressive assignment would call a further 0.9% as South Asian, 0.2% as European, and 0.1% as East Asian, leaving only 0.1% still unassigned (now adding up to 100.1% due to rounding). This aggressive mode tries to assign 0.1% of the 0.6% European as 0.1% Ashkenazi, a bit less than that as Northern European, but not specifically British/Irish, Scandinavian, Finnish, nor French/German, and finds no Southern or Eastern Europeans. 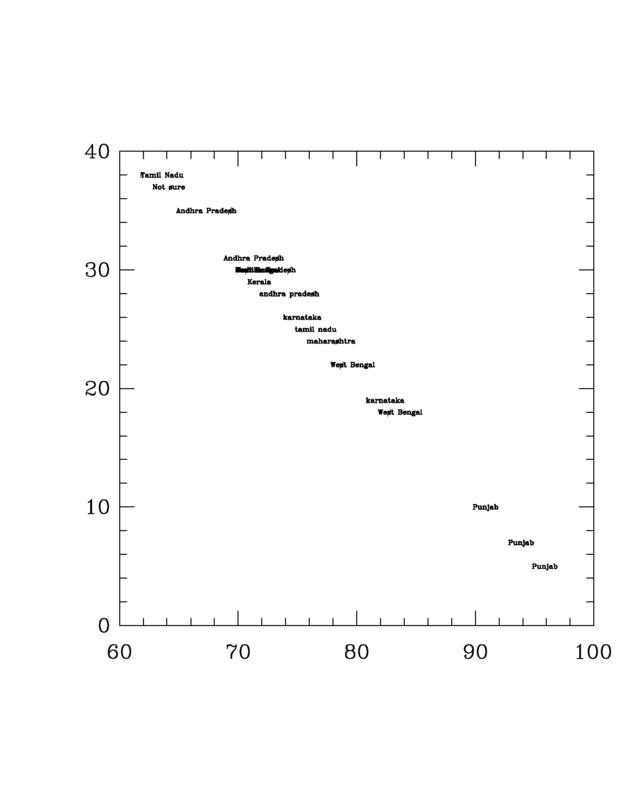 Alternatively, we can plot a sample of Indians on a two dimensional European-Asian plot (since the three numbers add up to one, this is sufficient; since most Indians have no African content, most lie along a diagonal). I also show such a plot here. 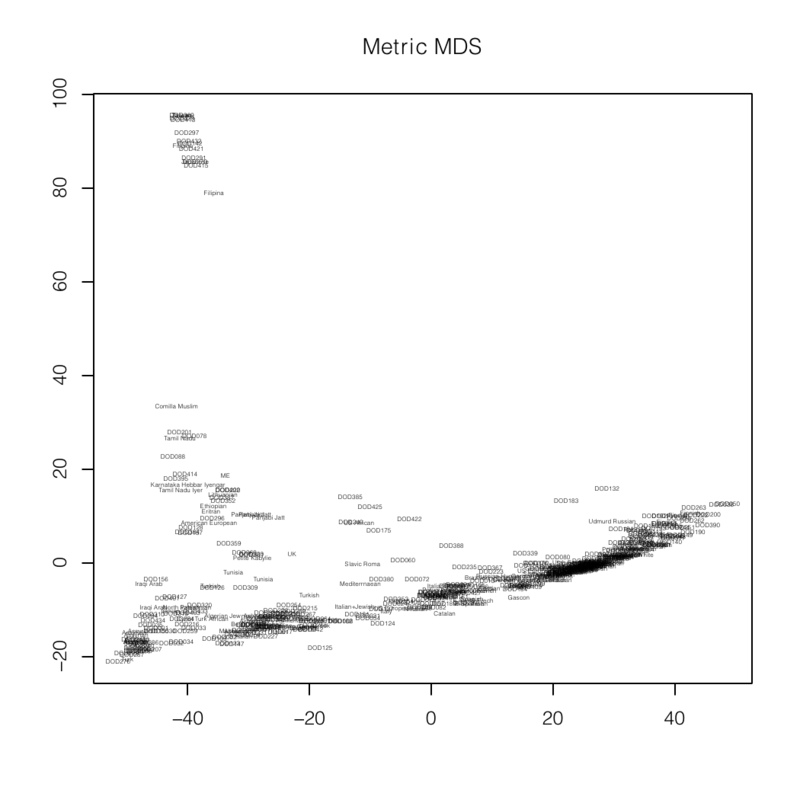 One can, instead try to visualize the distance from their reference groups in a low dimensional plot. In a 2-d MDS, it then clearly emerges that I am Central or South Asian. When only these populations are analyzed, it places me in the regular progression of Makrani, Brahui, Balochi, Sindhi, Pathan, Burusho, Hazara and Uyghur (the Kalash are separated along the orthogonal direction: roughly above the Burusho); right in the center of the Burusho cluster, in fact. Of course, since they do not have any Indian populations, this is not very unexpected. 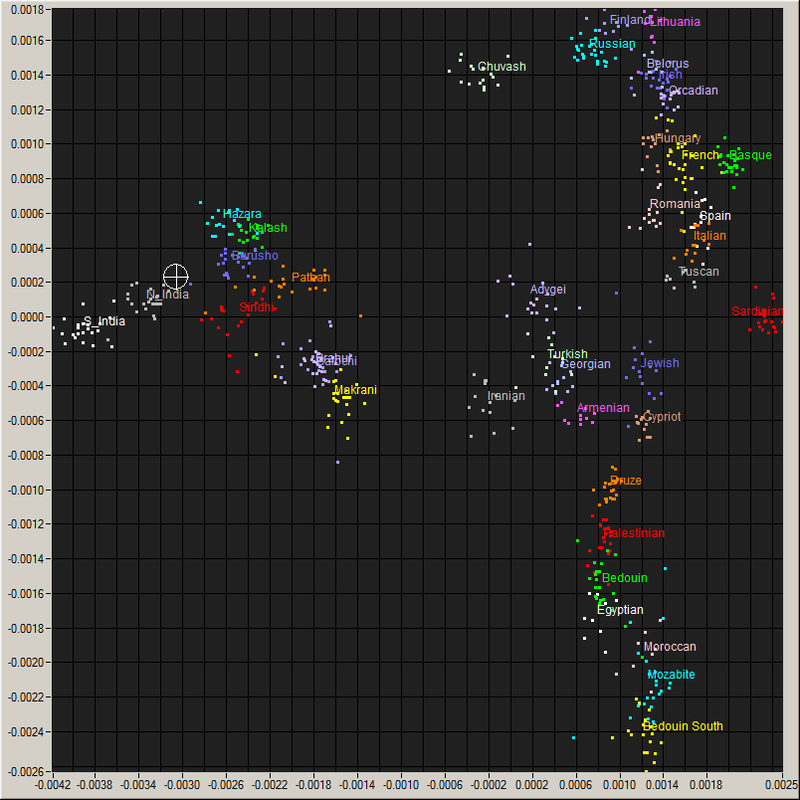 Me (Cross hair) on a plot of World populations and an enlarged view of the region around me. 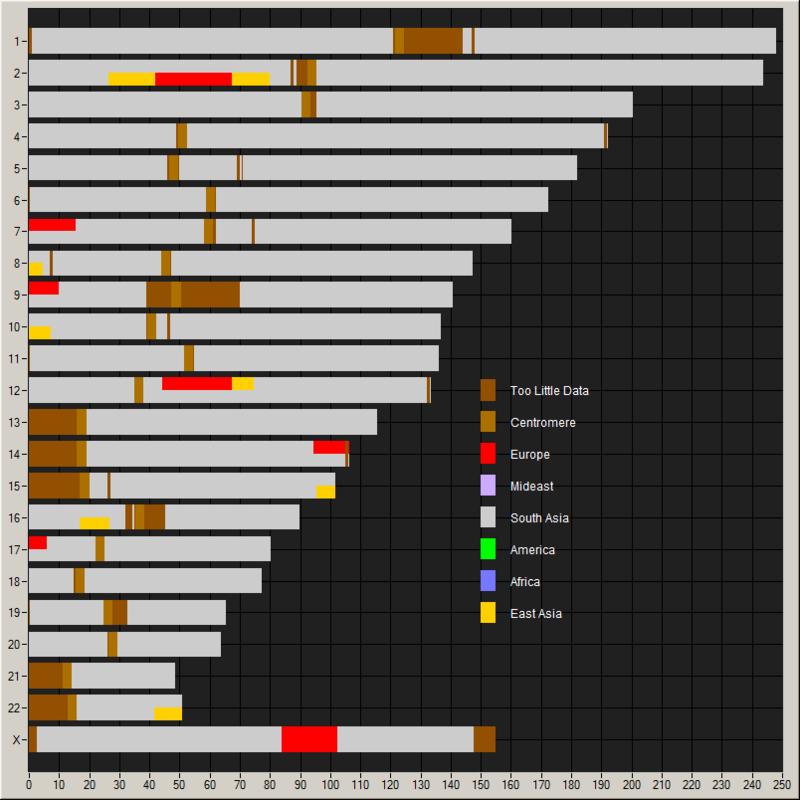 Chromosome painting showing contributions of various populations. Doug McDonald has a BGA project that can do a similar analysis with a much greater number of populations. According to him, I best test as 93% North Indian and the rest Eastern European; but recalling the 23andme results, 66% North Indian and the rest Burusho fits almost equally well. This, according to him, is typical of all-South Asian. His analysis would, therefore, put me at 29.7°N 74.5°E near Hanumangarh, India on the Pakistani border. He also provides a chromosome painting: this, he says is remarkably pure South Asian; only people from South India get purer than this; thus I am typical. My ancestry composition on a map. DNA Land does an ancestry analysis according to which I am 100% West Eurasian which breaks down as 65% South Asian, 28% Central Asian, 5.5% Finnish, and 1.8% ambiguous. The South Asian is further broken down as 50% Dravidian and 15% Gujrati, whereas the Central Asian is 25% Indus Valley and 2.1% Kalash. degrees of relationship from the Shared cM project. from the Shared cM project. The autosomal DNA also lets me search for relatives. As already discussed in the beginning, overall similarity is difficult to use because all humans are so similar. Instead, since in each generation the probability of recombination breaking up a stretch of DNA is given by its length in Morgans, my first cousin once removed is expected to have about 20cM long segments ‘half-identical’ to me (half-identical because of biparental inheritence). 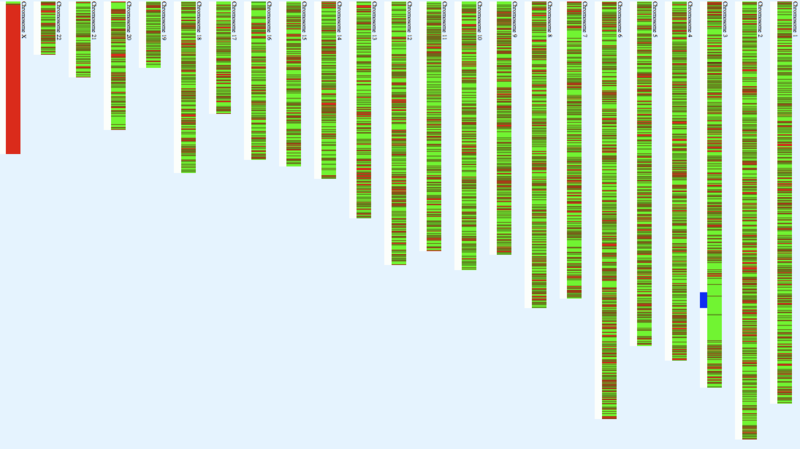 Also, in each generation, only half of the DNA gets transferred from any parent to an offspring, but since there are two last common ancestors to this cousin (my paternal grandfather and grandmother, in this case), the toral amount of match (in these stretches) is expected to be about 6% of the DNA with my first cousin once removed. When I compare me to Roshni Ray, I indeed find 25 half-identical regions, ranging in length up to 62.1 cM with an average of 21.08cM and covering about 7.08% of the DNA (527cM), and her brother, Krishanu, has 5.77% (429cM) of his DNA in 20 HIR stretches (max 59.6cM, average 21.45cM). Another first cousin once removed, Anirban Chakraborty has 5.46% (406cM) of half-identical DNA in 16 stretches averaging 25.375cM each (largest 23.6cM). Roshni's daughter Aria (my first cousin twice removed, so should have about 3% of her DNA in 10cM HIR stretches) has about 2.22% (165cM) of her DNA in 13 HIRs (max 23.6 cM, average 12.69cM). On the other hand, if I look at just the overall identifty, the similarity even with Roshni is only about 75.8%, which is pretty comparable to that expected between unrelated individuals. It is only when I compared to her mother, my first cousin, Sumita (with whom I could expect an average of 40cM matches over 12% of the DNA; and indeed find 30 segments up to 111.1cM, with a mean of 31.5cM over 12.7%, 945cM, of the genome) that I find an overall similarity of 78.48%, significantly above the background. Matches much smaller than 5cM become likely due to other effects like selective sweeps, and if the match is on fewer than about 500–800 positions, it could also be due to random chance at more variable regions. Conversely, because of the threshold set for the comparisons, an occasional mistyping can break up a half-identical stretch to make it smaller than the threshold. Thus my first cousin once removed mentioned above shares with me a 8cM stretch which is absent when I compare her mother with me. People with various ancestries matching about 5cM segments on my genome. Relative finder on 23and me also finds 3 more individuals with a single segment each above their threshold, who share about 0.1% of the DNA with me. These are likely to be distant (at least 3rd or 4th; may be as far as 10th) cousins, but since they did not return my invitation, there is little I know about them. Kate Popova with a 5cm (0.07%) match is listed as a likely 10th cousin. In addition, ancestry finder on 23andme finds short segments (5–6 cM) which match with 11 individuals, only one of whom is named (Ed Febus from Puerto Rico, with Spanish ancestry). Three others have only United States as the known locations for their grandparents. Of the rest, one provides no information about their ancestry. One of the rest is from China, one from an Italian and Spanish background, one from Denmark, and one from German and Austrian background. There is one more whose known ancestry is German, and one Polish. In principle, all these could be distant cousins (say, 10th); or these short matches might be due to other effects like memories of parallel selective sweeps. The fact that two pairs (the Puerto Rican and part Polish; and an United States with the Spanish Italian) among these 11 potential relatives match on roughly the same segments needs to be considered in this. Jim McMillan's DNA cousins project also found three distant matches for me, all about 5cM long. One of them goes by Ponto Hardbottle and is a Maltese Christian and all of his known ancestry comes from there, and he is reasonably sure that no different ethnicity or religion contributed to his ancestry for at least half a millenium. Another, a Dr. James Owston, has Northern European ancestry and has extensive genealogical records for about 200–300 years (and much older when it touches European royalty). The third is Vladimir Markov, a Russian with Eastern European and Central Asian ancestry; his mother is from the Urals, and Dodecad analysis puts him close to the Pathans. But 23andme thresholds don't find them as sharing segments, though the overall genetic similarity of one of the Owston cousins (Kristen E. Owston), Valdimir Markov and Ponto Hardbottle is almost as close as my first cousin (on father's side) once removed, Roshni. This overall genetic similarity, as discussed above, is actually a pretty bad indicator of recent ancestry, but it is interesting that I am much closer to them than my cousin. Gedmatch finds about a dozen people with one 5 cM or longer match; the largest two being about 8 cM. These two are could be as close as third cousins, but probably far more distant, if, indeed, these are not false positives. Most of these are based on a few hundred SNPs, which is really borderline, but at least two of them are matches in high density regions. I have not yet managed to contact them. 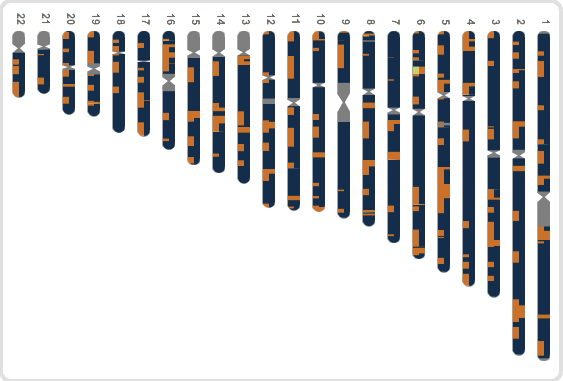 The HIR Search site finds 68 matches of 5cM or more: the largest match being of 8.9cM with 662 SNPs. I haven't studied these results in detail, yet. gedmatch site. Green is homozygous and red is not. Most of us have two parents, four grandparents, and eight great grandparents, but as we continue backward; this increase is arrested because of inbreeding. Most of us belong to small population groups that have exchanged grooms and brides amongs them. The homozygosity of the DNA (both strands having the same base) can be used to measure the size of this effective population of intermarrying individuals that leave many descendants. A publicly available webpage allows this analysis, and my 23andme results contain large runs of homozygosity. On Chromosome 3, I have for example, runs of length 8.38 (2017 calls), 9.05 (856 calls), 12.46 (2997 calls) Megabases and many smaller ones. All total, I have 44 runs of more than 200 homozygous basecalls, totalling about 69.539% homozygosity in the autosomes. In comparison, there are only two short stretches of heterozygosity greater than 20 long, totalling about 29.66% heterozygosity in the autosomes. 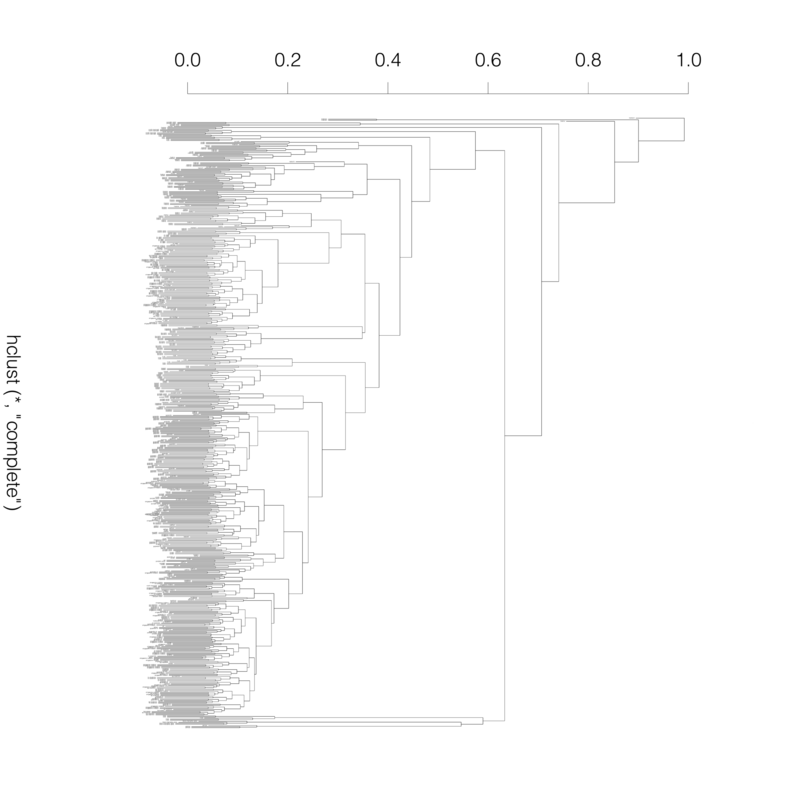 Such a pattern (presence of multiple 10–12 Mb runs) is typical of South and West Asian populations, and shows recent (about 150 years) parental relatedness. The gedmatch site performs a more detailed analysis, and reports that the largest single-block was about 1.439 cM (946 SNPs) and the total was about 2.162 cM (1568 SNPs in blocks more than 500 SNPs in size). 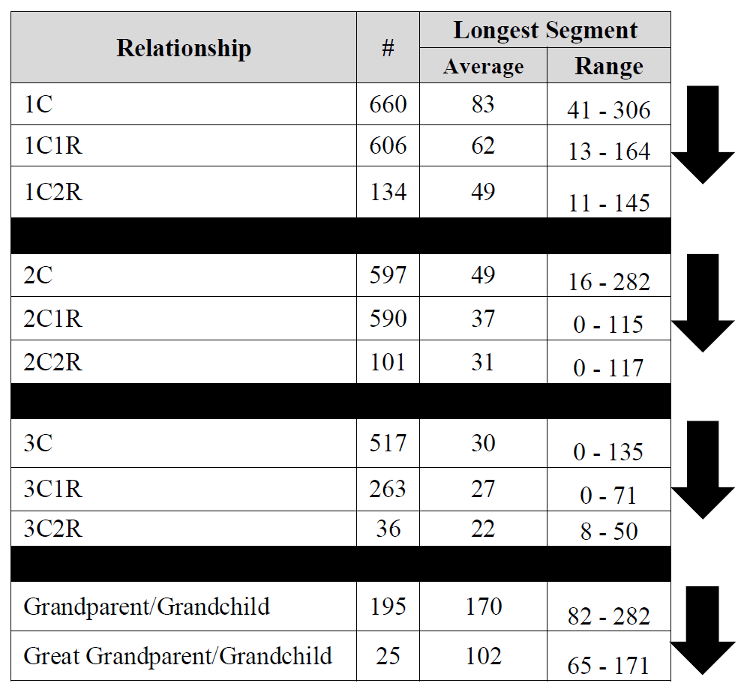 These numbers are very small, and are probably both in the same region on Chromosome 3 (thus making a selective sweep an attractive explanation) and I would expect this would mean that even if the homozygosity is due to consanguinity, the last common ancestor of my parents was probably more than 7 or 8 generations back. One way one gets an effective population size much smaller than the census size is when rapid selection weeds out the unfit. 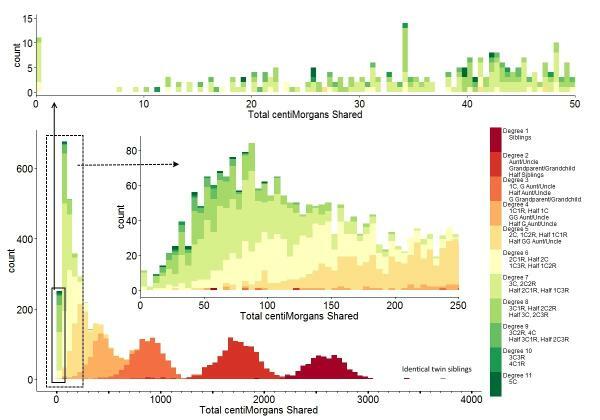 Rapid selection, however, leaves traces in the genome of large regions with low diversity: the size of these regions is limited only by the efficacy of recombination maintaining diversity as the selection proceeds, and decreases with time due to intermingling of people who faced different selection pressure. These selection pressures seem to have been different in different regions of the world, and have been studied. Analyzing my genome as an European one, I find that of the 57 locii under rapid selection (with 20 favoring the ancestral allele and 37 the derived one) for which my genotype at a linked locus is known, I am heterozygous at 16, and am homozygous for the derived allele in another 20. Of the 41 homzozygous locii, I carry the selected allele in 23 (16 ancestral and 7 derived) of them. probably between 47–65 kiloyears ago. Though modern humans are predominantly the descendants of a group of humans that moved out of Africa some 100,000 years back, there is increasing evidence that they did interbreed with previous ‘humans’ that have been coming out of Africa starting about a million years ago. These previous humans, like the Neanderthals in Europe, and the ones who left the famous fossils like Java man and Peking man left paleolithic tools, and belong to a variety of species and subspecies in the homo genus. Studies of the variation at different locii on the human genome; and especially the study of Y- and mt-DNA shows that the genetic component of these other groups is negligible in every modern human population. In fact, some regions of the genome seem completely free of Neanderthal admixture, suggesting, for example, males born of Neanderthal mothers and modern human fathers were infertile. Nevertheless, there are tantalizing little clues of these early interbreeding, though the total genetic contribution of these earlier humans probably does not exceed about 10% in any extant human. On the other hand, some estimate that as large as 20% of the Neandethal genome survives in some or the other human: giving humans better adapted alleles for keratin, as well as diseases like diabetes and Crohn's disease. Of the most well established of these mixtures is the evidence of Neanderthal component in non-African populations and Denisovan component in some Melanesians. The evidence is, however, statistical and much further work will be needed to identify precise locations that can be associated with such ancestry. I do not, however, have the telltale Archaic/Neanderthal marker B006 on my X chromosome; instead I have the cosmopolitan B001 which is found in 12.5% Africans and 35.8% non-Africans. According to the online analysis presented by the Stanford site, out of the 42 differring between the African human populations and the Neanderthals, I am heterozygous at 12 of them, and homozygous for the non-African allele at one more. 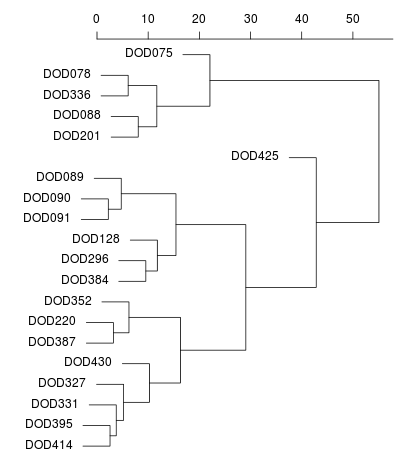 I can't quite reproduce this when I compare the my data to the published Neanderthal/Denisovan data: I find a region on Chromosome 6 comprising 8 SNPs where I am heterozygous for the Neanderthal allele (the Neanderthal is derived in this region), and another on chromosome 10 comprising 5 SNPs where I match a non-African allele (4/5 match the Neanderthal, 4/4 sequenced in Denisovans, including the non-match to Neanderthal, match the Denisovan). 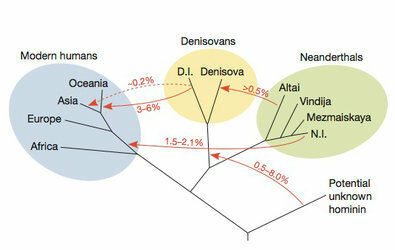 Denisovan alleles being common all over, and especially in regions around Southern China (see figure 1E of the recent paper on this issue), this is not unexpected. 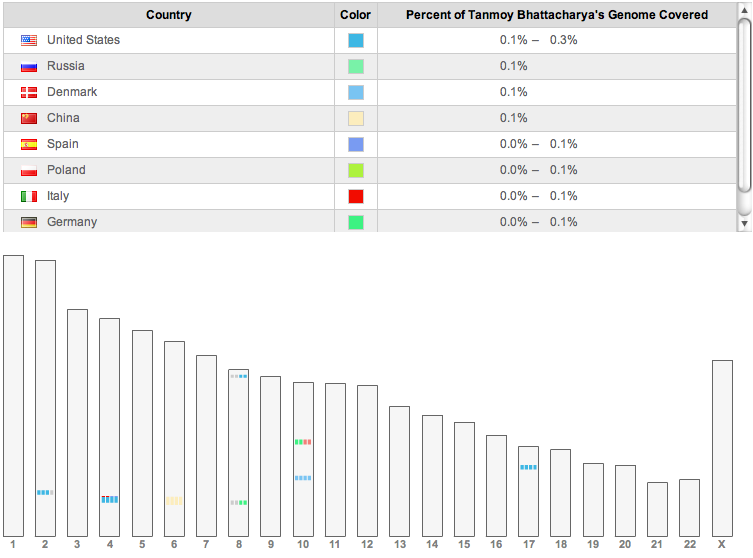 23andme site estimates that 2.6% of my genome is of Neanderthal origin, where the average South Asian has 2.5%. According to them, this puts me at the 68th percentile. Of the far more diffuse evidence from the earlier studies, which were done before the Neanderthal genome was sequenced, I am heterozygous for the MAPT locus with one copy from the H2 clade, which had been claimed to be associated with the Neanderthals; but the explicit sequence of the Neandarthal genome does not confirm the Neandarthal origin of this.